How Can I Get Rid of Body Acne? Back acne, arm bumps, and chest breakouts, are the most common forms of body acne. It can take a while to figure out if you are allergic to foods, skincare products, or medications, so while you are figuring that out, here’s a new way to detoxify your skin, and get rid of body acne. Volcanic mud has been used for centuries by those native to volcanic islands. 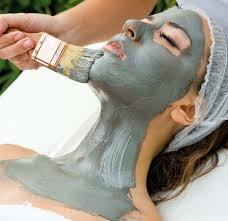 In Europe, mud wraps are known as Fangotherapy, because fango, in Italian, means mud. Fangotherapy is offered at top healing resorts, for people with auto-immune disorders, and chronic conditions, such as fibromyalgia, cystic acne, eczema, and psoriasis. Mud wraps are also used in these Italian Spas. for psoriasis, severe acne, and chronic muscle pain. Because it is high in natural sulfur, the volcanic ash heals chronic skin dermatitis. It is interesting to note that the FDA has approved sulfur as an acne treatment. Volcanic mud is usually a blend of volcanic ash and mineral water. Sometimes peat is added to the paste. On a dermatological note, because volcanic mud is high in silica, which absorbs into the skin rapidly, it creates a youthful skin, and is recommended to be used often, in order to reduce wrinkles and fine lines of the face, neck, and hands. For acne sufferers, it can speed the healing of acne scars. For body skin ailments, take a full body wrap, in volcanic mud for 20 minutes, followed by a thorough rinse with purified water. This will produce a skin like a baby’s, as volcanic ash is also a natural exfoliator, which is yet another reason why it can rejuvenate skin cell disorders. For facial skin ailments, apply volcanic mud to the face, as a mask, for 15 minutes, then rinse with warm water, several times a week. The natural sulfur in volcanic compounds will do far more for your skin than synthetic, sulfur based creams. If you love natural substances for healing acne, also read about Activated Charcoal.